When I stumbled into reviewing the MMXIV EP by Minnesotans Cold Colours I thought I am introducing a new band to the MetalReviews pages, but was surprised to find that my colleague Andy already covered their earlier full-length eponymous release, giving them a little harsh marks, especially for the quality of their songwriting. I am not sure why MMXIV comes out as a self-financed release after the previous album was on a label (Sleaszy Rider Records). 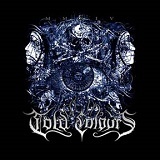 Maybe Cold Colours, and their mastermind Brian Huebner, have decided to start anew. If they did, and MMXIV is certainly their fresh start with me, I did not spot those songwriting faults Andy has descried. All three songs on the EP are going somewhere, with their driving dark melodies. Sometimes the cleaner acoustics and keyboard flavouring touches are mixed with slowed down Gothenburg sound (Heathen). From This Pain presents a loopy repeating melody with Primordial persistent guitar hooks (only with a lot less passion). From This Pain then subsequently proceeds to put on a full double bass press and even some blast resemblance. Terminal Winter is at first a slowed down brood, until it slips into Sentenced-like groove. Mid-career Sentenced could actually be somewhat of a comparison here, as these songs do call for a cleaner voice, but a brief passage in Terminal Winter shows why that method of delivery is not chosen. Brian's harsh vocals are not any more impressive, are purely paint-by-numbers and would not be confused with outstanding. Fortunately for Cold Colours guitar work on the EP is strong (including solos) and for this genre of metal it is a determining factor. MMXIV is not a bad way to breathe a new life into a band.